Created in November, 1991, Arenal Volcano National Park is quite recent but it is one of the most visited areas in Costa Rica. It’s terrain goes from 1300ft to 5757ft height above the sea level, being the highest part the Arenal Volcano’s crater, which is located just 10.5miles west from La Fortuna. It’s 29850 acres of protected areas include important places for water reload of aquifers, also are home for a rich diversity of wildlife, such as: Keel-Billed Motmot (Electron carinatum), the Great Curassow (Crax rubra), the Bare-necked Umbrellabird (Cephalopterus glabricollis), Three-wattled Bellbird (Procnias tricarunculatus), among many others. However these are the most popular and figure in IUCN’s Red List, labeled as vulnerable or endangered species. There’s an estimate of 469 species of birds that can be found within this place. It is also home for several species of mammals like the Puma or Cougar (Puma concolor), the Jaguar (Panthera onca), 3 species of monkeys, Howler (Alouatta palliata), White-faced (Cebus capuchin) and Spider (Ateles geoffroyi), as well as wild pigs, Coatis and many others. 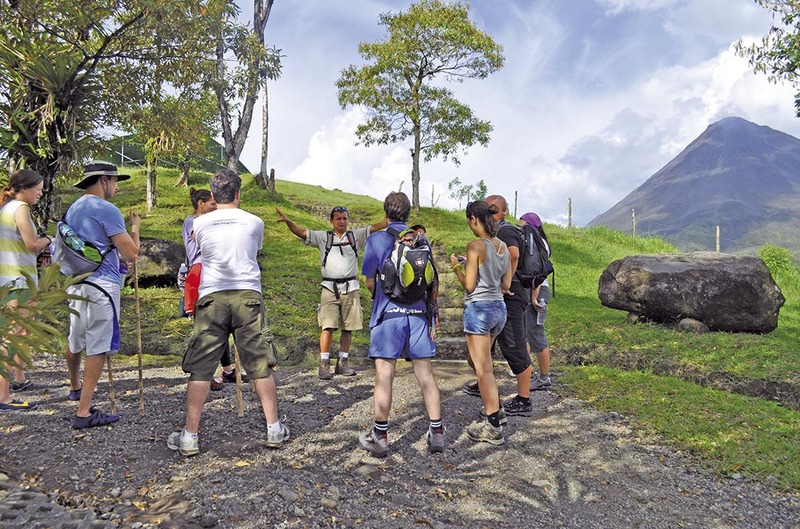 Arenal Volcano National Park, offers trails that feature an immersive and quickly changing vegetation. A big section of the park shows secondary forest and sections in recovery, as plants and trees slowly claim the desolated parts barred by Arenal Volcano’s 1968 and 1992 eruptions. Las Coladas (1.24 mi): This is the main trail and the easiest one as well. Vegetation is mostly composed of a variety of cane (not sugar cane) and some rather small trees. Inclination of the trail isn’t significative either until reaching 1992’s lava flow where you’ll find steps carved out of the lava stones. El Ceibo (1.12 mi): This is a variation of the main trail, where you take a wide loop to return to las coladas trail, few meters before starting to climb the lava. This is the richest of all the trails, vegetation here is part of a primary forest, so you’ll be covered by high tree branches and have a bigger chance to see some wildlife. This trail’s name comes from a centenary Ceibo Tree, located almost at the middle of the route. This tree is quite impressive and worth to see. Las Heliconias (0.62 mi): The shortest trail, is also the less interesting unless you travel with a very experienced guide who talk you about interesting facts about the secondary forest. This trail is completely populated by canes (again not sugar cane) and tall grass, which happens to be a poor source of food for most species, but if you are lucky enough you could find a lost coati, a snake and some birds. La Peninsula (1.75 mi): This one is located outside the Main Ranger Station area. Like most of the other trails it can be found in Google Maps. It has a particular view of the lake and you can walk to the very border or it. There is a big rancho with benches and restrooms here, bring your food as its a nice place for lunch. Although Arenal Volcano National Park offers only those trails by the main Ranger Station, there are other beautiful places and natural wonders within this park’s area. El Silencio Trail: Located a few miles from the Ranger Station, offers a beautiful viewpoint to the Volcano and a trail among a dense vegetation of trees. There is a great chance to see some wildlife as it is more private than the Park’s trails. Javier is member of Travel Arenal's Marketing Team, an Industrial Design Student and amateur photographer for this website. Loves grill's and follows GB Packers. Also owns a dog. Hi Tom! It’s about 150km or 93mi, it takes about 2,5 hours across beautiful scenic route around Arenal Lake. Is there a way to purchase the $15 pp tickets in advance? Hi Andy, unfortunately National Parks service is quite prehistoric in that. You have to pay $15pp to the ranger in the entrance and that has to be in cash. Hi Emily! It’s actually ilegal and dangerous hiking up to the volcano crater if that’s what you mean. Although your entrance include access to the whole park, it’s strictly recommended that you remain within the indicated trails, whose mayor highlights are the Centenary Ceibo Tree and two viewpoints at 1992’s lava flows. What hours of the day does the park operate throughout the week? Hi JG, the Park is open from 8am to 4pm, Monday through Sunday. How much can can you expect in the Arenal Volcano park area during July ? You can expect a lot of tourists as July aligns with many countries summer vacations, including Costa Rica. Weather is mostly sunny, although some days it might rain during the morning or the evening. It gets harder to see animals when there’s to much people in the park, so you may want to try El Silencio Trail, a private wildlife reserve within the limits of Arenal Volcano National Park. You have better chances to see wildlife, specially birds, and it is not as trendy as the National Park, here you can expect less people in the trails. The only thing missing at El Silencio are the view points over the old lava flows, although there is one very impressive view point to the volcano. We’ll be adding El Silencio Trail to our tour shop soon, I’ll let you know with a reply to your comment when it is up. Is there parking fee? Can you get a guide at the entrance? Is it good to drive from San Jose to arsenal? Hi Pho! There’s no parking fee, you get it granted when you pay your entrance. There is 1 guide (maybe 2), so staff is very limited and you may have luck or not to hire one. San Jose to Arenal drive takes about 2 to 3 hours, so if you come very early you’ll be able to make a lot during the day before having to return to San Jose. Even better is at least spending one night in Arenal, since there are lots of nice places to see. What is the weather like from 8/18 on? Would you recommend a tour guide for a family of six people? Does access to the park allow us to walk on the hanging bridges? Weather is very hard to tell for Arenal, even our national weather institute said they can’t accurately anticipate what is going to happen, but rains are expected to be normal in August (which means short duration rains in the morning or evening or none) and to be a little more dry during September. When you go to public places with high visitation like Arenal Volcano National Park or Mistico Hanging Bridges it is definitely recommended to hire a guide. Imagine yourself walking around seen trees and plants that might be not relevant to you at all (unless you are a biologist/botanist) and lets say you are even lucky to spot some monkeys in the trees and a coati digging in the forest (you might or might not know the name of this raccoon like creature). But with a good guide, you’ll know which of those plants in the forest are important, what are their leaves used for, which animals depend on them, the same with trees. A guide will tell you what specie are those monkeys you see, how many monkey species you can find in Costa Rica and possibly some funny or interesting facts about them. Plus their trained vision will give you the chance to spot animals that are harder to see like: birds, bats, snakes, frogs, bugs, even sloths, which because of their camouflage pass unaware for most visitors. If you visit the National Park I encourage you to hire a guide, as otherwise you’ll miss geological and historical information about Arenal Volcano that isn’t written anywhere. Arenal Volcano National Park has no hanging bridges, you have to go to a private reserve to enjoy Hanging Bridges, which could be “Mistico Hanging Bridges” or “Sky Walk”.